"It's an off-roader's dream: a federal management plan making nearly 2 million acres of public land a playground for off-highway vehicles." Located in central Utah, the Richfield BLM district ecompasses spectacular redrock canyons, unique badlands, peaks over 10,000 feet, and portions of western Utah's Basin and Range region. While oil and gas development presents an increasing threat to these wild landscapes, off-road vehicle use remains the biggest concern. The BLM took a big step toward reducing this problem in 2006 when it implemented emergency motorized travel restrictions on the delicate Mancos shale badlands surrounding Utah's famous Factory Butte. Unfortunately, the agency's final resource management plan proposes to allow ORV use in this previously closed sensitive area, fails to protect most of the agency-identified wilderness-quality lands, and adopts an ORV plan with routes in BLM-inventoried roadless areas and even Wilderness Study Areas. Status: Final Resource Management Plan released, Protest Period ended September 8, 2008. Read SUWA's fact sheet on the Final Richfield RMP. 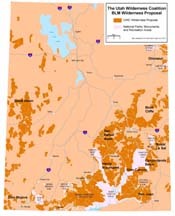 Click to view detailed maps of proposed wilderness in Utah.